Pork chops, for me, have rarely been a success, which would explain why Dave was less than pleased when he first saw the chops for this recipe in the fridge. So, since I brine chicken breasts frequently, I decided to try a quick brine for the pork in this recipe and thankfully, the results were worth the little bit of effort. 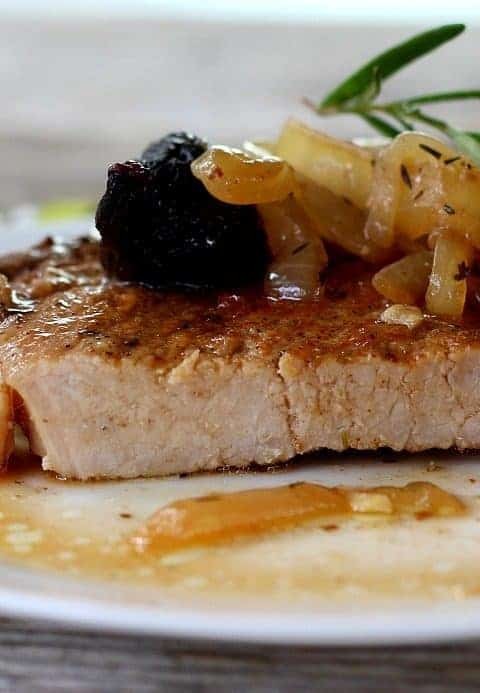 Balsamic Pork Chops with Figs and sweet onions is easy and delicious, whether done in an electric pressure cooker (Instant Pot is what I have) or on your stove. The pork chops become tender and are flavored with sweet onions, balsamic vinegar, thyme, white wine and broth. 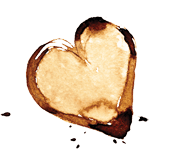 This strangely perfect combination creates a balsamic au jus that reduces and becomes infused with the dark sweetness of dried mission figs. Brining the pork chops is certainly optional but if your pork chops are thicker than 1/2″ thick I would definitely do it. The brine in the recipe here does not use a lot of salt, just enough to yield perfectly tender meat. Also if you really want a good helping of the au jus, you can easily double everything except the pork, onions and figs. Making Balsamic Pork Chops with Figs and sweet onions is incredibly quick with my Instant Pot, incredibly tender thanks to the quick brine, and incredibly tasty thanks to the unique au jus in the recipe. You can’t beat that combination. The quick brine method in this recipe is optional though recommended to ensure tender chops. Feel free to also double the vinegar, white wine and chicken broth in the cooking recipe if you want even more balsamic broth. Brining directions: If you have time, brining the pork for even a brief period adds flavor and ensures juiciness in the finished chop. Bring 1 cup of the water to a boil, add the salt and optional flavorings, and stir to dissolve the salt. Add 2 more cups of cold water to bring the temperature of the brine down to room temperature. Place the pork chops in a shallow dish and pour the brine over top. The brine should cover the chops — if not, add additional water and salt (1 cup water to 1 tablespoon salt) until the chops are submerged. Cover the dish and refrigerate for at least 1 hour, up to 8 hours. Instant Pot directions: After patting the chops dry, lightly season them on both sides by sprinkling them with salt and pepper. Add 1/2 tablespoon of the butter and 1/2 tablespoon of the oil to the Instant Pot and using Saute' function, adjust heat to Normal setting. Add 2 pork chops; brown for 3 minutes on each side. Move chops to a plate and add another 1/2 tablespoon butter and oil. Add the other 2 chops and repeat browning process. Remove those chops to the plate. Add the onions and saute' for 4 minutes or until the onions are transparent. Stir in the garlic; saute' for 30 seconds. Stir in the thyme and balsamic vinegar. Cook uncovered until the vinegar is reduced by half. Stir in the wine and broth. Add the pork chops, spooning some of the onions over the chops. Place the figs on top. Lock the lid in place, turning the steam release valve to Sealing. Touch Manual setting and adjust time to 9 minutes. After cooking time, release steam with Quick Release method. Serve immediately. Stove Top method: After patting the chops dry, lightly season them on both sides by sprinkling them with salt and pepper. Add 1/2 tablespoon of the butter and 1/2 tablespoon of the oil to a 6-quart dutch oven or large saute' pan with a heavy bottom and heat to medium-high. Add 2 pork chops; brown for 3 minutes on each side. Move chops to a plate and add another 1/2 tablespoon butter and oil to the pan. Add the other 2 chops and repeat browning process. Remove those chops to the plate. Add the onions and saute' for 4 minutes or until the onions are transparent. Stir in the garlic; saute' for 30 seconds. Stir in the thyme and balsamic vinegar. Cook uncovered until the vinegar is reduced by half (this doesn't take long). Stir in the wine and broth. Add the pork chops, spooning some of the onions over the chops. Place the figs on top. Reduce heat to medium-low and cover the pan and cook for 15-20 minutes, until the pork chops reach an internal temperature of 165F degrees. Plate the pork chops and serve with the onions, figs and balsamic au jus over the top. If desired, continue to cook the onion mixture over medium-high heat for an additional 4-5 minutes to caramelize the onions and infuse the fig flavor into the mixture. This method will reduce the amount of au jus, however. Oh my this looks amazing!!! I did the onions a bit differently for this recipe. After I browned the chops, I wrapped them in foil to keep them warm while I slowly browned white onions in the pan drippings. White onions are great for caramelizing, since the sharper the onion, the sweeter it will be once cooked. Excellent tip, Beth. Thanks for sharing!